Google just announced new updates to Assistant and Google Home. The smart speaker leans on Assistant to offer voice controls and artificially intelligent, well, assistance. But until now, the gadget hasn’t really been able to do that much. Thanks to some updates, however, that might change very soon. The new Google Home features help the smart speaker anticipate what you want to do, adds hands-free calling, and expands the device’s entertainment options. Long story short, your Google Home will start talking to you in new ways. Sure, the features make it seem like Google is just catching up to the Amazon Echo, but that’s something. Smart speakers are pretty stupid until you activate them with a wake word like, “Okay Google.” Thanks to an updated Assistant, Google Home will soon be able to push out alerts like heavy traffic on the way to a calendar event or flight change status. You can also program Assistant to send reminders. It’s unclear how much control you’ll have over these kinds of alerts, but hopefully, the answer is: total. All calls to the United States and Canada will be free. Calls made from a Google Home will show up as “Private,” but you can customize it to show your phone number. Google did not say whether you can handoff a call from Google Home to a smartphone—or vice versa. Sadly, this very cool feature will be “rolling out over the next few months.” That might mean August. That might mean December. On top of integrating a whole bunch of new smarthome devices, Google Home will soon work a lot better with entertainment services. First, there’s music. Spotify, Soundcloud, Deezer, and others will soon work with Google Home. And—even if you thought this was already possible—Google Home now supports Bluetooth connections so you can connect other devices to Google home. Next, there’s television. This actually seems pretty cool, too. A Chromecast update will soon turn your TV into a Google Home display. That means you can ask Google Home about your morning schedule and a calendar will pop up on screen. You can also ask Google about the weather and, you guessed it, a forecast will show up on your TV. Things get really cool when you start asking Google Home to show you content like YouTube videos. Saying “show me a monkey drinking its own piss” should theoretically pull up a video of a monkey drinking its own piss. You can also call up TV shows thanks to some new YouTube TV integrations. In conclusion, using Assistant on the new Google Home is a lot like using Assistant on the old Google Home, except it’s slightly more useful. 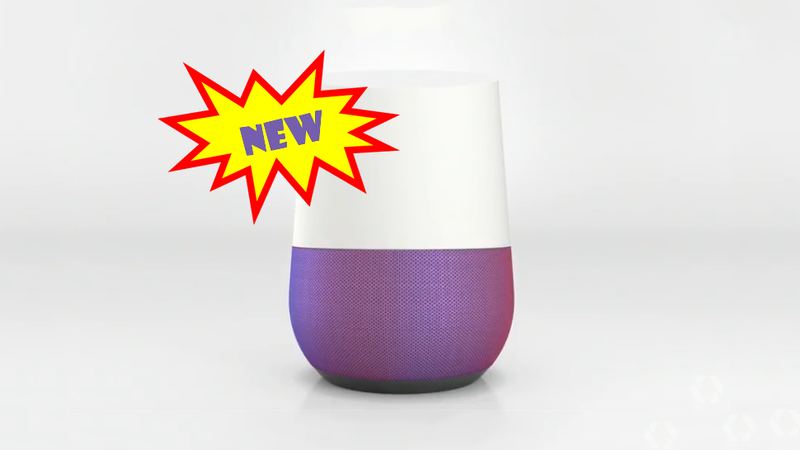 Are these updates enough to talk you into buying a Google Home over an Amazon Echo? We’ll have to wait and see.